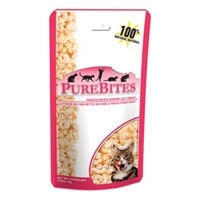 Our PureBites Freeze Dried Shrimp Cat Treats are sure to drive your kitty wild. Cats crave the ocean goodness and love the taste of shrimp. These cat treats are freeze-dried to preserve the natural nutrition and freshness of shrimp. These cat treats are high in protein, less than 1 calorie per treat and are a rich source of vitamin D, vitamin B12 and omega-3 fatty acids for a happy and healthy life. With only one ingredient…100% natural and pure shrimp, this is a wholesome and nutritious treat that will satisfy your furry little friend.